1. 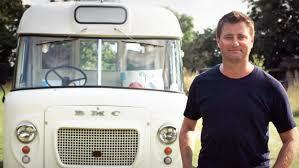 George Clarke’s Amazing Spaces, Channel 4. Now I’m a little behind on the new series of this, but I just watched the amazing Fairy Tale Hideaway episode this morning with my little famalam and we were most impressed. The spaces are just brilliant and it amazes me how the people manage to create them with sometimes quite meager budgets. My recent favourite was the warren style underground garden hidey hole that a couple had built for both them and their children, Little M and I were truly smitten and spent most of the program dropping big old hints to Mr Potato Head about how wonderful it would be if we could have something similar in our back garden. 2. One Born Every Minute, Channel 4. Now I know this isn’t everyone’s cup of tea, in fact I couldn’t watch this until quite recently as although my Little M is now 6, the whole child birth experience was still quite raw and I did not want to watch something that took me back to it (lets just say it wasn’t a calm and tranquil experience for me). However now as M gets older and I pine away at little babies and get all broody I AM LOVING this program, clearly I had a bad experience but watching these ladies and the midwives that support them is pretty inspirational, well it is to me anyway. And did I mention I’m pretty nosy, well I am and I love all these fly on the wall, real life, documentary programs. But I’m also really pleased to see such an important job from both the mums and the midwives being promoted and celebrated in the media like this. So my third and final program, or channel in this case, is a YouTube vlogger who is huge, you all probably know her already but if by some slight chance you don’t, do have a look. I particularly like her vlogs on this ‘Sprinkle of Chatter’ channel, because I like the more informal chatty approach she seems to have on here. She also has a main channel called Sprinkle of Glitter, where she does hauls, beauty tips and even some quite poignant comment at times. I think I’m particularly smitten with Louise because I feel we have similarities, she’s a mum, she’s a little bit older than some of the other popular YouTubers (although quite probably not as old as me, but not far off) so we have similar reference points and I find her very easy to relate to. She is also hilarious and when she vlogs with others like the ever popular Zoella then you often feel, a little bit, part of the gang, well at least like you are laughing with them and that’s what I like, I guess it’s a little bit of escapism and an easy to watch, feel good vlog. So as I mentioned at the start, I’m struggling a bit with TV and what to watch lately, got any recommendations? I’d love to hear them.